Mary Teresa Decker was born August 4, 1958 in Bunnvale. She spent the first 10 years of her childhood in Hunterdon County before her family moved to Southern California in the late 1960s. It was on the West Coast that she began distance running. She won her first event at age 11. Mary was obsessive about training. This paid off in the short term, as she was able to compete in multiple events in a compressed amount of time. Over the course of her career, however, Mary’s harsh regimen would contribute to injury problems. Too young to qualify for the 1972 Olympics, Mary was nonetheless ranked #1 in the US and 4th in the world at 800 meters (roughly a half-mile) that season. In 1973, she set a new world record at age 15 in the indoor mile with a time of 4:40.1. Within a year she also held world records at 1000 meters, 800 meters and 880 yards. Unfortunately, injuries kept her out of the 1976 Olympics. Mary kept running, and in 1980 she became the first woman to run the mile in under 4:20. She was unable to run in the 1980 Olympics after the US boycotted the Summer Games. 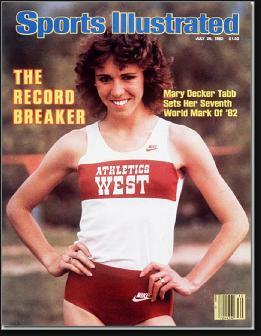 In 1982, Mary won the first Double-Decker—the 1500 and 3000 meters events at the World Championships. She won the Sullivan Award that year as America’s top amateur athlete. Finally, in 1984—after waiting a dozen years—she was ready to put her skills on display in the Olympics. The 3000 meters final pitted Mary against Zola Budd, the barefooted South African distance runner. Toward the end of the race, as Mary was preparing to make her move, Budd cut her off and she fell, injuring her hip. No one could believe her bad luck, especially Mary, who was inconsolable as she limped away. Mary’s life brightened in 1985 when she married Richard Slaney, an English discus thrower. It was Mary’s second marriage. That season she set new record and won more races. In 1986, she took a year off after giving birth to her daughter, Ashley. While preparing for the 1988 Olympics, her body began to fail her for the first time. She spent much of 1987 recovering from injuries and failed to medal at the 1988 Summer Games in Seoul. She tried to qualify for the Olympics in 1992, but did not make the US team. The 1996 Olympics offered Mary—now 37—yet another chance for glory. She made the US team at 5000 meters but did not make the Olympic finals. Afterwards, she was accused of taking a banned substance, which she claimed was the result of taking birth control pills. Lawsuits and accusations followed. Meanwhile, Mary underwent several operations to relieve the pain in her feet and legs. She retired form competitive running after failing to qualify for the 2000 Olympics and moved to Oregon with her husband.